Amsterdam is a city that has been built over the water, that's why it is also known as the northern Venice. Recognized by UNESCO as a World Heritage Site, there are more than 100 miles of canals that structure the city. Those are the major tourists attraction. Besides its uniqueness, the canals are the historical image of the Dutch golden age (XVII), when they were built. Brouwersgracht is considered one of the most beautiful streets by many. Known for being the most popular and picturesque neighborhood in Amsterdam, this district has the main offer of prostitution in the city. In Netherlands, the prostitution is legal and accepted for the majority of the society. That fact makes the Red Light District one of the most liberalized areas in the world of drugs, sexuality and prostitution. Netherlands has among its ranks many of the most influential painters of history: Van Gogh, Rembrandt, Goltzius, Vermeer or Mondrian. The capital pays tribute to these geniuses with different internationally renowned museums. Located in Museumplein, the square of the museums, we find the Rijksmuseum, the Van Gogh Museum and the modern art Stedeljik Museum. Located at the center, there is the Rembrandt House Museum. In this city marked by art, there are many attractive cultural offers. Those are just the most popular ones. With more than 470.000 square metres, it is the biggest park in Amsterdam. It's a perfect place to disconnect from the environment of the city: walking, practicing sport, enjoying a lunch, dog-walking but, above all, riding a bike. Vondelpark welcomes about 10 million visitors every year and in 1996 it was declared a national monument. It's the epicenter of Amsterdam, the point around which the city was created. It is considered as a meeting point for citizens and in the center there is an obelisk dedicated to the fallen soldiers during the Second World War. The square is surrounded by the majestic Royal Palace, the wax museum and the Nieuwe Kerk. This is one of the most important buildings of Amsterdam. Built in the 15th Century, it has been the site of coronations and royal weddings since 1814. 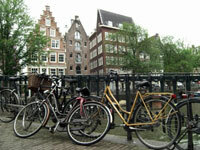 It's the ideal area for nightlife and entertainment in Amsterdam. During the day the street performers seduce tourists and during the night there are open restaurants, theaters, cinemas and nightclubs. There is also a significant presence of coffee shops and bars where smoking marijuana and hashish is legal. Undoubtedly, it is an international tourist attraction and a unique peculiarity of Amsterdam. Located above the Singel canal, this is the only floating flower market in the world. You'll find about twenty sites where, during all seasons, they sell all kinds of flowers like tulips, narcissus or bulbs. It is a big pleasure for all senses, especially, the sight and the smell. It was at Prinsengracht 263 where Anne Frank, the famous Jewish girl, lived during 2 years and wrote her notebook during the Second World War. Nowadays, the rooms at the Anne Frank House, still breathe the atmosphere of that period of time. You'll find quotations from the diary, historical documents, photographs and original objects that belonged to her. A piece of memory of the Netherlands' worst years in recent history.